Here's one I hadn't seen yet, though I wish it were true! I could use 45.5 years of Premium! Dang. That would be awesome. Did you use this bonus code? So much premium........Why did you report this? Maybe he paid for 26610 days and only got 16610? Of course, I only _actually_ received 3. Now if I'd REALLY gotten this many....what bug? I heard you were the guy, yea, the guy giving out free premium... ._. 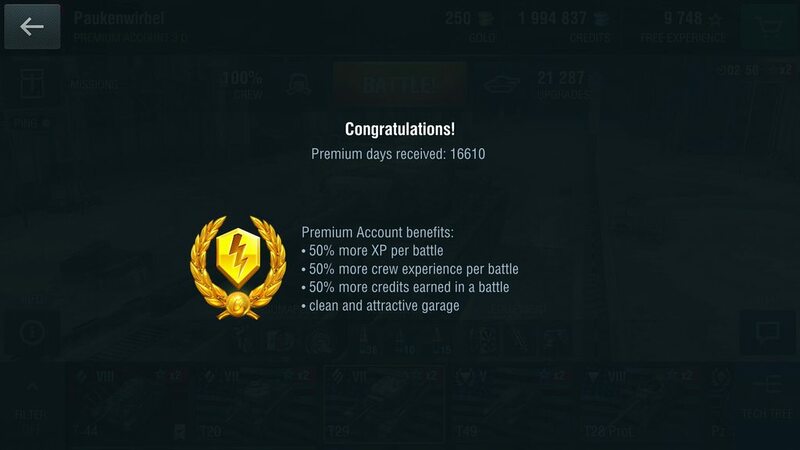 I got 3 premium days as well. That amount of premium days is extremely rare. It is probably something wrong when that happened when a dev was modifying the accounts with premium days. Lucky I never got mine. If you wanted your free premium account, you needed to play a battle between June 20 to June 22. If you did, they must have forgot to give you your free premium days. I did play on those days for that very reason, oh well time to submit a ticket.